As you can undoubtedly tell from this website, I spend a lot of time cruising the Internet. It’s a big part of my job and also a nice way to spend an afternoon. In the fine tradition of Twitter I figured I’d start using Fridays to spotlight websites or podcasts that I enjoy visiting. One of my favourite blogs to check in on is Third String Goalie. The format is simple. Each day, Jeff chooses a hockey jersey from his immense collection and explains the history of the sweater. Not his personal history with the shirt, but the career of the player, the history of the team and the events that were important to the jerseys’ era. For example, in a run up to the Olympic games Jeff has been looking at team jerseys from international competition. On Thursday he wrote about his 1998 Czech Republic Dominik Hasek jersey from the Nagano games. Jeff outlines the history of the Czech team and then goes on to explain how they fared in the 1998 tournament. Then comes the multimedia portion where he has photos of the 1998 jersey, the designs for the 2010 Czech jersey and video of the fateful shootout between Canada and the Czech Republic where Marc Crawford inexplicably kept Wayne Gretzky and Steve Yzerman on the bench. Every article is filled with exhaustive research and funny asides. Fortunately for the reader, Jeff is a freelance photographer, a career the affords him the time and energy to pour himself into each of these pieces daily. That's right, you can see brand new material every day of the week. Incredible! You can also follow him on Twitter. It’s one of my favourite reads, and Jeff was kind enough to submit himself to an email interview. JCH - How did you get started? Where did you get the idea for Third String Goalie? I got started doing the blog because I participate in a message board called JerseyCentral.org. On the message board is a thread entitled "What are you wearing today?" It's a place on the board to show off a jersey that is separate from the "new arrivals" thread. I found myself posting jerseys because of a significant game being played that day or an anniversary of something noteworthy, such as the anniversary of the Miracle on Ice. My explanations were getting a bit longer each time and I realized I had even more information to share than I was posting. In addition, I have a pretty sizable collection and a desire to share it with people beyond just posting pictures of them. I wanted to explain the significance of why I recreated that specific jersey, as most of my jerseys have some sort of story to tell. Since just having pictures of them online wasn't satisfying and I didn't want to hijack the message board thread with overly long stories, it occurred to me that a blog was the way to go. Even before I started the blog, I had the name filed away, having come across it while reading an article in an old issue of Baseball Digest from 1956 that was a humorous glossary of terms. 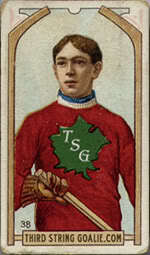 One of the entries was "Third String Catcher", which meant a fan in the stands wearing a jersey. First, I thought "Well, that pretty much describes me." and thought it would be a great name for a website. When I started the hockey blog, I just changed it to "Third String Goalie". JCH -You've been blogging since May and have over 280 posts, averaging more than one post per day. How do you keep up that pace? The combination of being freelance and the economy being lousy has give me a lot of free time. Blogging is a great way to escape reality! I do most of my writing after my son goes to bed in the evening. JCH - What was your first hockey jersey? My first jersey was a white Minnesota North Stars jersey from the early 80's. I bought from the team souvenir stand. It was out of stock and took forever to arrive. JCH - What is your favourite jersey? Hard to pick just one, but my favorite is my early 90's Soviet Red Army jersey. It's such an icon with the hammer and sickle logos, stars and name on the back in Cyrillic. JCH - What do you look for in a jersey? I've always liked a jersey that tells a story of some sort. Any jersey that you can put an extra patch on is desirable in my book, be it an anniversary, memorial, Stanley Cup Finals or tournament patch. I've bought jerseys because they used a cool font for the numbers, because they came up with a great looking design, because they came up with a horrible design, because it was a jersey of a favorite player or represents a significant occurrence, like the 1972 Summit Series. JCH - What's the ugliest jersey you've ever seen? The nicest? Yes, the Los Angeles Kings really wore this. The ugliest in my book is the 1995-96 Mighty Ducks of Anaheim alternate "Wild Wing" jersey. 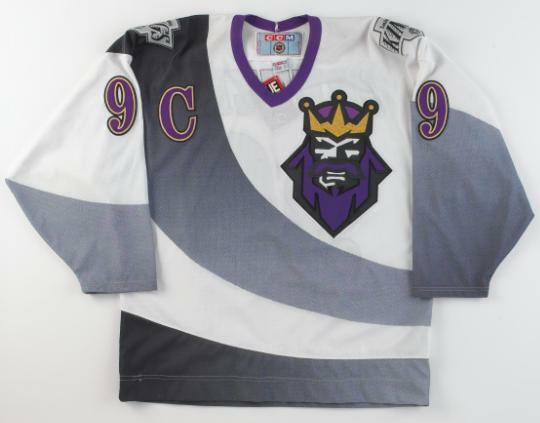 While the Los Angeles Kings 95-96 alternate "Burger King" jersey is really weird and the Dallas Stars "Mooteurs" is mind-numbingly ugly and dumb, the "Wild Wing" lacks any dignity at all. It just reeks of being designed by people with no appreciation for NHL hockey and I can't believe they even asked NHL players to wear it. Of those three, it's the only one that's so stupid that it makes me mad just thinking about it. Of course, I own two of them! The nicest. I really liked the Dallas Stars green and black jerseys with the star pattern first used as an alternate in 1997-98 that they won the Stanley Cup in. That was such a nice looking jersey when it first came out I was able to overlook the fact that it was my old North Stars team that was stolen from me wearing it and knew immediately I needed to buy one. I also like the classic Boston Bruins jerseys worn from the mid 70's to the mid 90's. JCH - On your blog you advise your readers to "never, ever tuck your jersey into your pants." Any other sweater faux-pas you want to speak out against? I'm not a fan of putting you own name and number on a jersey, but can understand the reasoning why people do it. Those people are not the ones sitting there with Thrashers Kovalchuk or Wild Gaborik jerseys today. There's no hope of any resale value in putting your own name on the back, but many people don't plan on selling theirs. The thing that's really starting to annoy me is the number of people who could care less that they have bought a horrible, horrible Chinese knockoff. There are some that are just dreadful. I once saw a vintage Washington Capitals Alexander Ovechkin jersey were all the red parts were orange. ORANGE! The fonts were off, the colors were off, Ovechkin never wore that style. Have some pride, man. That said, the copies are getting much better and if Reebok hadn't jacked up the price on the new, ill-fitting edge jerseys (where if the body fits, the arms are way too long) by a good 50% to $120 over the wonderful CCM 550's that were $80 AND cheapened the jerseys at the same time with screen printed, brittle shoulder patches and screen printed numbers made to look like quality sewn numbers, there wouldn't be such a market for a lower priced alternative now, would there? JCH - How do you do all that research for each blog post? The Internets. It's all out there waiting to be found. I do have a library of hockey books to fall back on, but most of it comes from an assortment of websites I rely on like IIHF.com. One place I go out of my way not to use are other blogs. I don't want to come across as having copied their work. Perhaps we will arrive at a similar story, having found the same information, but I do find my information on my own. I do have to go out of my way to mention NHLUniforms.com. I bet I have visited that site every day for the last eight years. JCH - I was most impressed with your Jan. 29 post on Bob Sauve's Buffalo Sabres jersey. How did you ever get all that detail on the players' experiences combating the blizzard? I got lucky and found an article on SIVault.com that had the quotes in it. I don't use that site as much as I should, as I often find their information concerning factual things differs at times from other websites. For example, the number of Sabres players they listed having made the plane trip to Montreal was different that other sites. Perhaps SI originally stated "Don Luce arrived at the airport and he and 14 others made the trip". Other websites will take that and repeat is as "14 players made the trip". I assume that an article written in February 1977 based on first hand interviews with the participants will be more accurate than one created in 2007 with second and third hand information. It's funny how often I find conflicting information. I've seen Clint Benedict credited with wearing the first goalie mask for just one, four and five games on different websites. JCH - What are you most proud of on your blog? That I have stuck with the idea, that my work has gotten recognized somewhat and that I've tried to bring enough variety to my topics that it will catch people off guard from time to time. Like the blizzard story for example, or the one where I discovered that the entire reason the NHL was formed in 1917 was for the four owners to rid themselves of a fifth owner from their previous league who they couldn't stand! JCH - What do you hope your readers get out of Third String Goalie? An appreciation for a cool looking jersey, an appreciation for a player they may not have known much about before, like Stan Mikita, an appreciation for hockey beyond the NHL, especially international hockey with the Olympics on the horizon, and an appreciation for hockey prior to Wayne Gretzky. The NHL didn't start with Gretzky and has over sixty years of history to tell that many people are not aware of. Heck, the Stanley Cup was around a quarter of a century before the NHL even came to be. Most people have no idea that is the case. It's my hope that each day a number of people think "Well I didn't know that before" or are reminded of something from the past they hadn't thought of in a while. 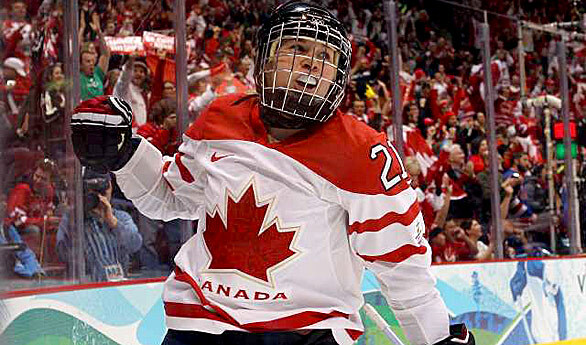 JCH - And finally... How can we get more Marie-Pier on Third String Goalie? If I ever do a story on the Montreal Canadiens, I see if she's got any relevant videos available. More Habs equals more Marie-Pier, even if I can't understand a single thing she's said. I try not to be too English-centric and have no fear posting videos in Latvian, Finnish, Russian, Swedish or French. I've had readers from 86 different countries, so it's nice to make them feel at home from time to time. There's something universal about an excited announcer screaming his head in Czech off after a goal that we can all understand and appreciate. This video has been making the rounds Monday morning, and it’s pretty tough to watch. At about the one-minute mark Team Canada’s world junior captain Patrice Cormier comes off the Rouyn-Noranda bench, skates through centre ice and lays out Quebec’s Mikael Tam with a vicious elbow to the head. Ironically, of the three leagues that comprise the Canadian Hockey League, it’s the Q that has a reputation of a softer, finesse style of play that emphasizes goaltending and skilled scorers. The events of this weekend underscored the fact that this really is not the case. Although I followed the results of that game, the summary really didn’t do justice to the viciousness of that hit. After all, "Penalties: ROU - Patrice Cormier (03:32)(maj.), ROU - Patrice Cormier (03:32)(match)" isn't much of a story. The QMJHL’s Disciplinary Prefect, Raymond Bolduc, is currently investigating the incident, and the league will take action in the next day or two. I expect that Cormier is looking at some lengthy time away from the ice. Watching the Tam video is reminiscent of Cormier’s hit in a preliminary World Junior Championship match against Sweden where he hit Sweden's Anton Rodin with an elbow and bloodied his nose. I thought Cormier took unnecessary penalties throughout the WJC tournament, and his actions definitely hurt Team Canada’s performance in the playoff rounds. Also on Sunday, Bolduc suspended Tommy Tremblay of the Shawinigan Cataractes for four games. Bolduc found that Tremblay had been the aggressor in a fight with the Victoriaville Tigers’ Guillaume Goulet. The left-winger earned two game misconducts during the game, and the league tacked on another two after reviewing videotape of the incident on Saturday. Additionally, the Cataractes were fined $500. I follow the QMJHL pretty closely, in fact, it’s my favourite junior hockey league. Although it’s not nearly as rough and tumble as the Western Hockey League, I think its physicality is under-rated. Although line brawls (like the one that happened between the Vancouver Giants and Prince George Cougars Saturday night) are rare in Quebec, the QMJHL has its fair share of truculence.